Our dictionary defines a Libertine as a person, especially a man, who freely indulges in sensual pleasures without regard to moral principles. Check the synonyms for yourself. Our musical principles point you towards the rather special English rock group The Libertines, no strangers to controversy for sure, but a mighty force in the post-punk or whatever scene. Formed in London by drama student Carl Barât and one time English literature student Peter Doherty in the late 90s their career – in both senses of that word – has won them acclaim and notoriety on an unparalleled scale. Their debut album Up The Bracket (title purloined from Tony Hancock’s usage of the phrase for a jab to the Adam’s Apple) is justly considered to be one of the great modern discs. Including the timeless agitprop choons “Time For Heroes” and “What a Waster” (on the latter-day reissue) this album announced the arrival of a band with literary flair and musical acumen. As such they have been hailed as inheritors of a legacy passed down via The Kinks, The Small Faces, The Clash, The Smiths and Oasis, all your faves: so, definitively British – English? – but with a Celtic flair to widen the purview and an American drummer to lick them into shape. 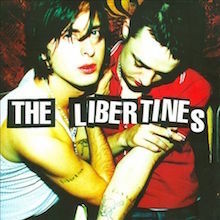 The self-titled follow up The Libertines (2004) hit the #1 slot in the UK and was voted into the New Musical Express list of the greatest British albums of all time. And it has stood that test. Immediate discovery, s’il vous plait! At time of writing (2105) their, um, long awaited third album, but what is eleven years between friends, Anthems for Doomed Youth, might be deemed the work of four men facing up to being thirty-something: whatever happened to The Likely Libertines kind of stuff… or maybe don’t think so much. Given their cultural bouillabaisse (Doherty loves Jean Genet, George Orwell and Oscar Wilde) while Carl is a full-on musician with an insatiable desire to get out there – if not in The Libertines, then with Dirty Pretty Things, The Chavs, Client et cetera) you are always likely to find and then discover something stimulating in their recordings, and their live shows, if you are lucky enough to catch one, are accompanied by an air of demented frenzy and expectation that you only ever get with music designed to raise your nape fuzz – Beatles, Bowie, Brahms. Thanks to their sterling rhythm section, North Londoner John Hassall and ever-steady New Yorker Gary Armstrong Powell, they hit the ground running with plenty of melody and bin bags of attitude. To quote Mr. Doherty: "It's like they say: Oasis is the sound of a council estate singing its heart out, and the Libertines is the sound of someone just put in the rubbish chute at the back of the estate, trying to work out what day it was". While Carl’s version of: to the toppermost of the poppermost was alleged to have been "It's either to the top of the world, or the bottom of a canal". Perfidious Albion salutes these geezers. The Libertines bonded over books and beer in the student halls that spawned their desires and the bars that inflamed their ambition. Suede’s visionary guitarist and songwriter Bernard Butler produced their debut single “What a Waster” (released 3 June 2002 on Rough Trade) while Clash man Mick Jones chuckled behind the console for the debut album Up The Bracket, that followed three months later and arrived as a quite perfect thing with its panoply of characters and dramatic scenarios inhabited by boozers, “good-time girls” and folks perched precariously between the dole and deliverance. The view from behind the riot shields that is “Time for Heroes” established their political credentials while “Don’t Look Back into the Sun” (later featured in The Inbetweeners, series 1 and episode 1, is an anthem that thrills. The second, eponymous album, spawned their biggest hit, “Can’t Stand Me Now”, co-written with Richard Hammerton (Mark Keds to Senseless Things fans) and “What Became of The Likely Lads”, a slice of rock and roll vérité that anticipated one of the many implosions in the Carl and Pete firmament and yet faced these with fortitude. Given their honesty it’s surprising that The Libertines haven’t released more singles but that only sends one in determined fashion to the albums, and age shall not weary them. The Libertines is densely packed with class songs: “Last Post on the Bugle” is a quixotic love song that bucks the notion Carl and Pete are only designed for the hedonist: quite the opposite, mon brave. This nakedly personal affair is packed with allusion. Ditto “What Katie Did” (is that you, Ms’ Moss), an ultra modern take on the long goodbye that brings tears to the eyes. “The Ha Ha Wall” and “The Man Who Would Be King” have the intensity of truly great performance art; don’t forget to leave the album playing to catch the hidden track, “France” which Barât brought along to their early demo sessions at Odessa Studios in East Larndan when The Libertines were young, free and single. In some ways the sub-textual infamy of The Libertines is only going to get in the way of discovering their music. If you knew little or nothing about their legend that wouldn’t detract from enjoying what they do, and so the current disc, Anthems for Doomed Youth details the facts of life without recourse to a primer, though a little knowledge of WW1 poet Wilfred Own wouldn’t be a bad thing. Produced by Jake Gosling (Ed Sheeran, One Direction, Paloma Faith, Wiley etc.) the bulk of the material was recorded in Thailand. According to Barât "What it boiled down to was that we wanted to try something a bit new with someone who is a bit new… we wanted someone who is getting their thing going, rather than someone who is just going to put us through their machine. This isn't a heritage band making a heritage album." Despite the title emotions are high and mostly upbeat, befitting sounds escorted to fruition in Karma Sounds Studios. Pete and Carl did the John and Paul thing and faced up to each other across a table with acoustics in hand to write the new material, bringing John and Gary in to whack them into structures bound for mastering. In 2104 The Libertines delighted their ever-expanding fan base by playing three sold-out nights at Alexandra Palace where their rehabilitated sound dived into wild nostalgia and hope of things yet to come. One older song, “You’re My Waterloo” survived the journey but the rest is brand spanking new and as warm as the waters on Ko Si Chang. Smiles and self-reference peek in on “Fame and Fortune” (their life in the fast line account of the old rags to riches story) while “The Milkman’s Horse” pinches some Motown and sets it to the kind of lyric that evokes British urban culture from the 1950s, and a fine place that is, to be sure. “Glasgow Coma Scale Blues” and “Gunga Din” (hello, Rudyard Kipling) are examples of Doherty’s finest singing, also deliciously harmonised by Carl and co. Available in Digital, CD and Vinyl Anthems… also comes as a Deluxe Edition with “Love on the Dole”, “Bucket Shop”, the fantastic “Lust of The Libertines”, “7 Deadly Sins” and “Over It Again (Japan Bonus Track)”. Unveiling the album with a “week of shenanigans” at The Dublin Castle (a legendary London rock pub) monies were collected for the Amy Winehouse Foundation and a good time was had by all. It’s grand to have The Libertines back. Will they stay, or will they go? Catch them while you can. 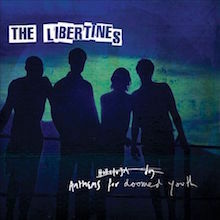 It's hard to think of a more fitting title for the Libertines' third album than Anthems for Doomed Youth. After all, youth is destined to end quickly way or another, via either death or getting older. Pete Doherty, Carl Barât, and the rest of the band managed to survive their twenties, and in the 11 years since they've made an album, they seem to have gained the knowledge that you can't just rehash the past. Wisely, on Anthems they focus on where they are now: cautionary tales such as "Fame and Fortune" and "Iceman" come from the perspective of those who have already been through these kinds of crises. Musically speaking, Anthems for Doomed Youth is also more mature; lead single "Gunga Din" trades in slow-burning reggae-punk that is more considered and contemplative -- at least before it catches fire at the end -- than much of what the Libertines have done before. At times, the album sounds surprisingly tame, thanks in part to Jake Gosling's manicured production; that the Libertines chose a former One Direction collaborator is another reminder of how far removed they are from the early 2000s, when they worked with Mick Jones. But for every moment that could use a little more grit, like "Belly of the Beast," there are more that make the album's subdued sound a strength. The reflective, self-referential title track proves that the Libertines' gift for mythologizing hasn't gone anywhere, while "Dead for Love" and "You're My Waterloo" -- which the band has had in its pocket since 1999 -- boast a polish and grandeur that they didn't always have time for back in the day. Similarly, the tempo shifts and complex structure of "Barbarians" are tight instead of shambling, suggesting that on a level of craft, they can even surpass where they've been. The Libs save Anthems' out-and-out rockers for last, almost as if they're conserving their energy: "Glasgow Coma Scale Blues" and "Fury of Chonburi" are the closest the band comes to reliving the good old days, while "Heart of the Matter" is an anthem fueled by venom. That the Libertines spend so little time revisiting their iconic sound on Anthems for Doomed Youth underscores that while it may have been sparked by how well-received their reunion concerts were, the bandmembers made this album primarily for themselves. In that regard, it's as authentic a return as a fan could ask for, and works equally well as a final chapter in the band's story or a new one. The British press seems eager to add the Libertines to the canon of great British bands as soon as possible. Not just because their music carries on the traditions of previous greats from the Beatles to the Clash, or because of their involvement with already-legendary figures like Alan McGee, Mick Jones, and Geoff Travis, or because their peers in the British music scene just weren't as interesting to cover, but because the band's future always teeters between dazzling and dangerously uncertain. At the very least, they're guaranteed a spot in the history books as one of the most volatile bands ever to come out of the U.K. McGee, who has dealt with such notoriously difficult personalities as Oasis' pugnacious Gallagher brothers and My Bloody Valentine's hyperperfectionistic genius Kevin Shields, has called the Libertines "the most extreme band I've worked with." Co-frontman Pete Doherty's stints in and out of rehab, jail, and the band itself lend the Libertines an unpredictability that's both brilliant and frustrating. the Libertines' self-titled second album -- which was released when Doherty was out of the band, awaiting trial after pleading guilty to possession of an offensive weapon, a switchblade he picked up after fleeing rehab in a Buddhist monastery in Thailand -- ends up being frustratingly brilliant: it's not a pathetic last gasp from a band crumbling under the weight of its troubles, but it's not entirely a rallying, rousing cry in the face of these problems, either. Yet, considering how shaky Doherty's own existence, much less the Libertines', often seems, it's more than a little remarkable that as much of this album works as it does. Both Doherty and Carl Barat have grown as songwriters since Up the Bracket, and this album's best songs use Doherty's problems and the duo's strained camaraderie as fodder. On "Campaign of Hate," the single "Can't Stand Me Now," and "What Became of the Likely Lads?" they find common ground and sardonic fun in being inelegantly wasted: "Blood runs thick/We're thick as thieves." But most of The Libertines' strongest moments aren't necessarily its catchiest ones; rave-ups like "The Narcissist," a putdown of the "professionally trendy," and "Arbeit Macht Frei" fall flat, and "Don't Be Shy" is a draggy mess made more uncomfortable by Doherty's stumbling, burned-out vocals. However, when the Libertines don't pretend that the party is still going on and give in to their collective hangover, the album really takes shape. Interestingly enough, the band's darkest moments shine the brightest, and The Libertines' most ambitious songs seem to have been the easiest for them to pull off. "Last Post on the Bugle," "The Man Who Would Be King," and "The Saga" have a martial intensity and plenty of angry, self-aware lyrics ("You dig my bed/I dig my grave"), but these songs, "Tomblands," and "Road to Ruin" still feel more effortless than the album's stabs at lightheartedness. Ever since their first single, "What a Waster," the Libertines' experience has been about life imitating art imitating life, and The Libertines is an accurate, sometimes uncomfortable reflection of the band at this point: more scattered and unstable than they were on Up the Bracket, but also more ambitious and more interesting. If they can somehow hold themselves together without losing the tension that gives them their spark, The Libertines might prove that the people who called them "the most important band of their generation" weren't being hasty after all. 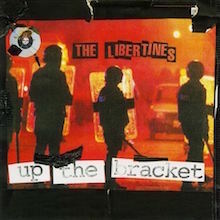 The first British band to rival the garage rock revival sparked by the Strokes and White Stripes in the U.S., the Hives in Sweden, and the Datsuns in, er, New Zealand, the Libertines burst onto the scene with Up the Bracket, a debut album so confident and consistent that the easiest way to describe it is 2002's answer to Is This It. That's not just because singer/guitarist Pete Doherty's slurred, husky vocals sound like Julian Casablancas' with the added bonus of a fetching Cockney accent (or that both groups share the same tousled, denim-clad fashion sense); virtually every song on Up the Bracket is chock-full of the same kind of bouncy, aggressive guitars, expressive, economic drums, and irresistible hooks that made the Strokes' debut almost too catchy for the band's credibility. However, the resemblance is probably due more to the constant trading of musical ideas between the States and the U.K. than to bandwagon-jumping -- the Strokes' sound owes as much to Britpop sensations like Supergrass (who had the Libertines as their opening band on their 2002 U.K. tour) and Elastica as it does to American influences like the Stooges and the Velvet Underground. Likewise, the Libertines play fast and loose with four decades' worth of British rock history, mixing bits and bobs of British Invasion, mod, punk, and Britpop with the sound of their contemporaries. On paper it sounds horribly calculated, but (also like the Strokes' debut) in practice it's at once fresh and familiar. Mick Jones' warm, not-too-rough, and not-too-polished production both emphasizes the pedigree of their sound and the originality of it: on songs like "Vertigo," "Death on the Stairs," and the excellent "Boys in the Band," the guitars switch between Merseybeat chime and a garagey churn as the vocals range from punk snarls to pristine British Invasion harmonies. Capable of bittersweet beauty on the folky, Beatlesque "Radio America" and pure attitude on "Horrorshow," the Libertines really shine when they mix the two approaches and let their ambitions lead the way. "Did you see the stylish kids in the riot?" begins "Time for Heroes," an oddly poetic mix of love and war that recalls the band's spiritual and sonic forefathers the Clash; "The Good Old Days" blends jazzy verses, martial choruses, and lyrics like "It's not about tenements and needles and all the evils in their eyes and the backs of their minds." On songs like these, "Tell the King," and "Up the Bracket," the group not only outdoes most of its peers but begins to reach the greatness of the Kinks, the Jam, and all the rest of the groups whose brilliant melodic abilities and satirical looks at British society paved the way. Though the album is a bit short at 36 minutes, that's long enough to make it a brilliant debut; the worst you can say about its weakest tracks is that they're really solid and catchy. Punk poets, lagered-up lads, London hipsters -- the Libertines play many different roles on Up the Bracket, all of which suit them to a tee. At this point in their career they're not as overhyped as many of their contemporaries, so enjoy them while they're still fresh.